A man stands over a tray of roasted pigs’ feet shouting out their price. Another man delegates his announcements to a recording, a woman’s voice pleasantly reciting a message in Mandarin from a small loudspeaker sitting on the table before him, next to a collection of cell phones. A rotund woman with pigtails and a sunhat weaves through the crowds waving a Bible in front of her, announcing something in Mandarin. 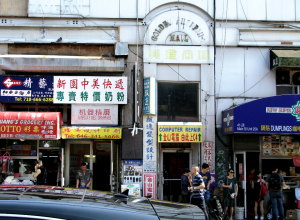 This is Flushing’s Main Street on a Sunday afternoon. The street is packed. Many people are here for food. 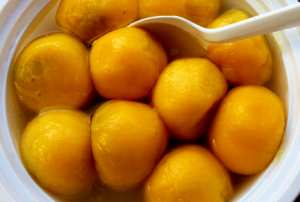 There are grocery stores on every block, with aprons of fruits of all kinds—jackfruits, lychees, melons, and more—spread invitingly before them. 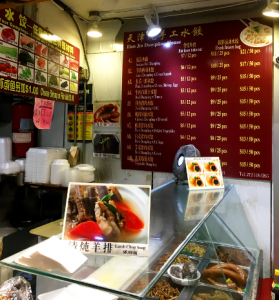 There are also restaurants, of course, but more strikingly, almost every block boasts a food court, packed with tiny restaurants and food stands. One of the most well known of these is a little difficult to find. 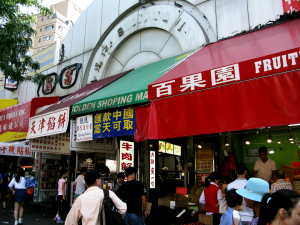 It is part of the Golden Shopping Mall, but if you go into the main entrance of the Golden Shopping Mall, you will only find shops selling shoes and porcelain along with a grocery store and a dumpling stand. The food court is in the basement, and can only be accessed by inconspicuous entrances at the side of the building. In the basement, you will find tightly interlocking restaurants—some with enclosed dining areas, but most with tables and benches spilling out into the narrow walkway. There are many regional cuisines represented here, from Sichuan to Shanghai. I chose to start with Beijing style dumplings and Xi’an style street food. 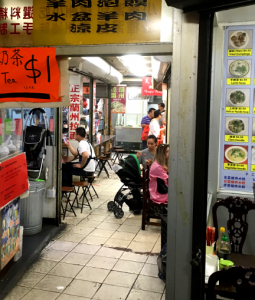 Tian Jin Dumpling House has a kitchen on one side of the walkway where dough and other ingredients are prepared and another kitchen on the other side where dumplings and other foods are boiled to completion. This latter kitchen is surrounded by a bar with stools, and it is here that you place your order. A glass window at the front tantalizes diners with a view of boiled ducks’ heads, sausages, fungus, and other ingredients that can be added to your food. I ordered lamb dumplings. This took a little time—apparently the lamb meat is ground and seasoned and enveloped in dough in the kitchen on the other side, and then these raw dumplings are carried over to be boiled. 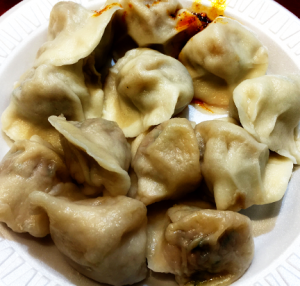 The skins of these jiaozi have a different textural quality from momos at Tibetan restaurants and from the baozi served at You Garden Dumpling House. I think it may be the slippery quality that Lin Hsiang Ju, the biochemist daughter of Lin Yutang, says can be given to noodles by rinsing and boiling them (she says this process causes a slippery skin of proteins to form around the noodles). Within, the meat is soft and almost sweet. I could not identify all of the seasonings. There were ribbons of something that looked like cucumber but had a rich, garlicy flavor. And there were peppers; these jiaozi were not terribly hot, but the peppers gave them a subtle warmth. For dessert I ordered pumpkin stuffed with sesame. These came piping hot. They are globes of seemingly intact pumpkin meat boiled to softness. Within is a pocket of black sesame seeds, lightly sweetened. The sesame seeds have a rich, thick flavor, reminiscent of sweet peanut butter. These are addicting. 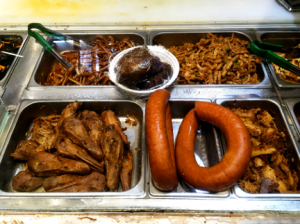 I made a separate trip to visit Xi’an Famous Foods, the little shop next door. 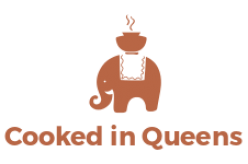 This is indeed famous, and has branched out to other locations in Queens and Manhattan. They specialize in the western-style food that you can find in Xi’an, which is known for its spicy noodles with bread. I opted to try a food that I think is meant to evoke the old Muslim Quarter of Xi’an: cumin lamb hamburger. 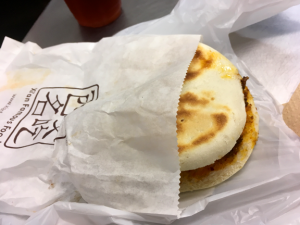 This is marinated, shredded lamb meat heavily spiced with cumin and enclosed in something like an English muffin. It’s quite good, and makes a perfect snack or light lunch on a hot day.